Introduction to Hydrometeorology is the study of the hydrolic cycle, which is the circulation of water from the seas, into the atmosphere, and back to either land or sea. This book describes hydrometeorology or the application of meteorology to problems that pertain to hydrology, and then discusses the approach, through meteorology, to the solution of hydrologic problems. 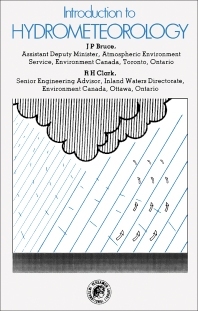 This text outlines observation methods on the subject and discusses the applications of hydrometeorology to problems encountered in the study of river and lake behaviors. Topics include precipitation, melting of ice, streamflows, lakes, evaporation, and evapotranspiration. The frequently used methods in analysis, such as employing statistics to hydrometereological problems, precipitation analysis, and streamflow routing are explained. This text also shows how extending streamflow records can be helpful in predicting the regime or course of a stream in the future. Records of seasonal and annual flow, flood runoff, peak discharge, as well as seasons of low flow and drought become useful tools in estimating the frequency and magnitude of streamflows. After which, the book discusses possible engineering designs in irrigation, storm sewers, and reservoirs. The text looks into the ways how human has influenced the hydrologic cycle through induced precipitation, melting of ice covers, and urbanization. Lastly, some climactic trends and cycles that bring about climate change and water resource development are discussed. This text can be used by students studying hydrology and those with meteorology majors. This book can also be read by meteorologists, environmentalists, and people working in general earth sciences.